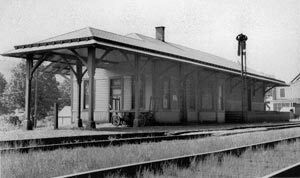 Roxbury has teamed up with the Delaware and Ulster Railride in Arkville on a number of occasions to present “Railride into Yesteryear”. This event was part of the celebration of the community’s Preserve America status and transported visitors back to enjoy “all the agreeable pursuits of 1898″. Guests boarded the Delaware and Ulster Railroad in Arkville and 45 minutes later they arrive in Roxbury, which has been transformed into the quintessential 19th-century mountain hamlet, appearing much as it would have looked 100 years ago. The scene’s authentic offerings included market carts, flower girls, vintage baseball, old-fashioned horse and carriage rides and authentic country fare everywhere.